Sun, Sand, Sea... Our home has views of the ocean, jungle and village. Sea breezes waft over you while you sleep in comfortable beds, with great linens. Giving to the L-shape of Casa Cuiza, both the living, kitchen, and downstairs bedroom, extend through large double doors and covered terraces to a centered beautiful lawn, tropical garden, and pool area. The house has three bedrooms, two upstairs and one downstairs. Upstairs the master bedroom, with a king sized bed, is in a spacious circular room with high domed roof. Attached to the master bedroom is a large terrace that overlooks the garden, pool and the amazing pacific ocean. Guests have enjoyed the terrace for yoga, romantic dinners and even a private salsa class or two. The other 2 bedrooms, one upstairs and one down, have Queen sized beds. The most prominent feature of Cuiza is it’s large private garden and lap pool. Tropical plants line a large grassy yard from which one can enjoy the view. The pool is ready for laps, or just to cool off. It's only a 5 minute walk to both beach and town. A shared private driveway allows for parking. My expert management team will make sure you have a wonderful vacation. This property was beautiful and the pool was awesome. We didn't realize that there wasn't air conditioning which would have made this spot perfect but I guess thats part of traveling sometimes. Loved the layout and the decorations. Interacting with housekeeping and the owner was easy and smooth. Thanks for a great time! We absolutely loved everything about our stay at Casa Cuiza. The home is beautifully decorated and wonderfully cared for. The location is perfect - an easy walk to town and the beach. Communication with the owner and property managers was easy. 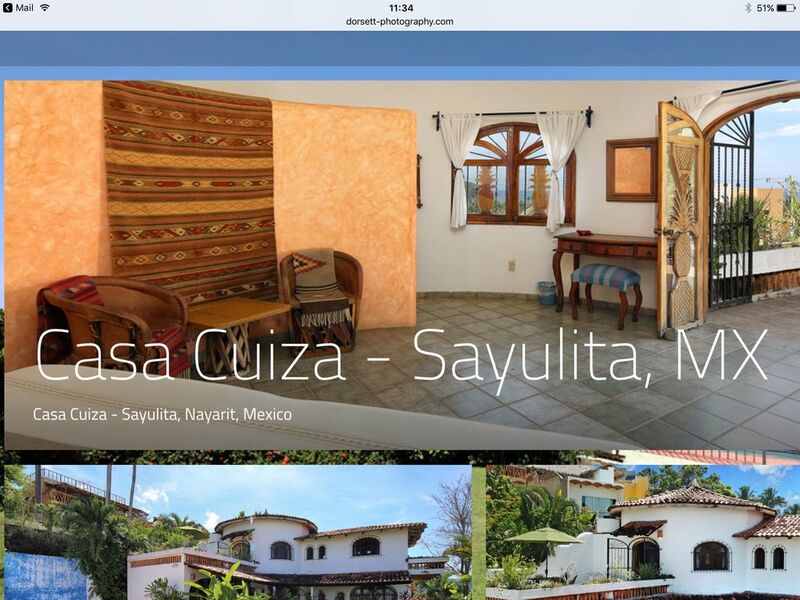 We all hope to return to Sayulita soon! Thank you for your wonderful review. Hope you come back soon. We had an amazing stay at the Casa Cuiza! Bette and the team at Casas de Primavera were super responsive and helpful. We had a few questions while we were there and they were answered right away. It was great to have the cleaning service come in a couple of times during our stay, as well as the yard and pool maintenance guys. The house itself is nice, comfortable, and well-appointed. It had all the cooking tools, utensils, and dishes we needed. It was great to have the lawn and pool for the kids to play as well. The house is also a quick walk to the beach and into town, so it was easy for us to get to where we wanted to go. I would definitely stay at Casa Cuiza again. We really were in love with this place until 6pm the night we arrived. The owner states she had no idea of this festival that’s gone on for decades. I was not told anything or heard about this famous week in a December. We never slept from cannons going off to concerts blaring into our casita until 4AM . Owner did nothing and never offered any compensation for our misery even though we contacted her immediately with video and audio of the chaos. We never slept for seven days straight! We were there for 10 full days. Anyone visiting Sayulita during the week leading up to December 12th will more than likely be awoken by the sounds of cannons, fireworks and church bells going off at 5:00 a.m., as Sayulita and Mexico celebrate Mexico’s patron saint, Our Lady of Guadalupe, also known as La Virgen Morena. A long-lived tradition, Catholics in Mexico rise before dawn and attend mass. It is common to see Virgin Guadalupe altars in homes, simple homages to the “Queen of Mexico,” with framed images of “Our Lady of Guadalupe”. Casa Cuiza is a beautiful five star house in which to have a wonderful holiday, the sum as great as the parts. Perched on the hill over town with a gorgeous view of the Pacific, you can hear the waves echo along the shore. It takes a mere five-minute walk to get both to the town centre and the long sandy beach. Verdant flowering gardens surround the house. The 25-meter lap pool offers a great swim workout. The owners have attended to furnishings that provide such a warm feeling, assuring the house is impeccably clean. The colourful kitchen is well equipped for preparing meals. The second floor bedrooms, each with their own terrace, perfect for meditation and yoga, overlook the garden with the Pacific in the background. We would return in a flash. This Villa slept the 6 of us pretty comfortably. There are lots of doors and window that you can open so for the hotter months thats a plus being theres no AC. Having a grassy patch is rare in Sayulita so kiddies would like that. We had a few problems with the showers not working the first 2 days but a visit to the office quickly solved that issue. Its very close to town and on top of a kinda steep hill so I would recommend a golf cart rental if you have little kids or if you can't handle the walk. The bus stop is just down the unpaved hill, very close. No kidding about it being called "Casa Cuiza" we had a pretty big maybe iguana in our room one morning! awesome.